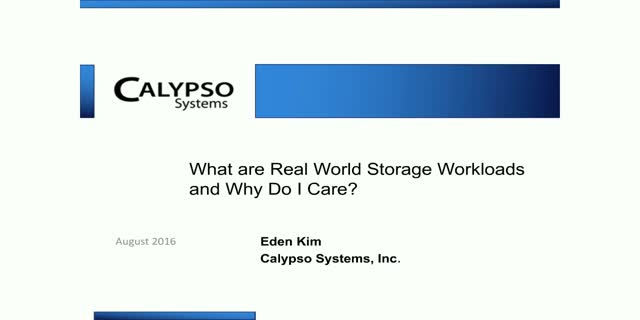 What are Real World Storage Workloads and Why Do I Care? A discussion and examination of Real World Storage Workloads and how different workloads affect Storage and SSD performance. Using free IO capture applets from www.TestMyWorkload.com, see what IO Captures look like and identify the key real world workload metrics. An example 2,000 outlet retail store web portal 24 hour workload is examined using advanced data analytic tools. Overall 24 hour cumulative workloads and specific process segments are used to test 3 different SSDs to observe their relative performance. See how much performance and endurance different SSDs provide and how to select the best SSD for your application and use case. IO Captures can be done easily and quickly on any laptop, desktop, server or data center. Join a community dedicated to the capture, analysis and accumulation of user workloads for the benefit of the storage industry. Title: What are Real World Storage Workloads and Why Do I Care?